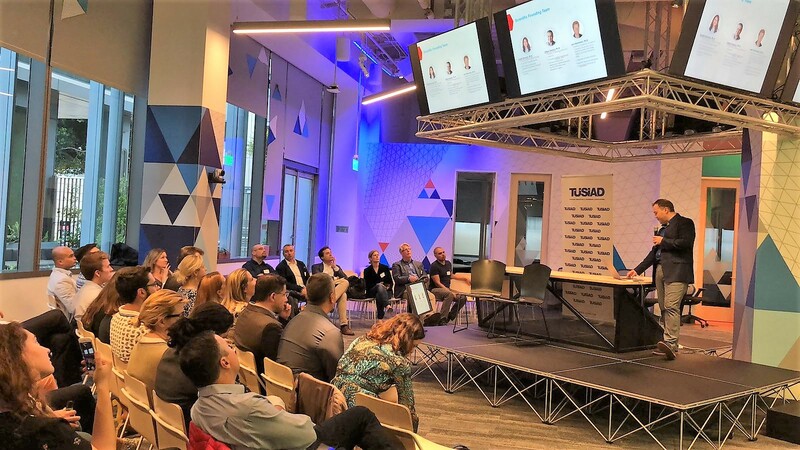 The TÜSİAD Silicon Valley Network hosted a talk by Dr. Utkan Demirci on “Academic Entrepreneurship Through Innovation” on June 11 in San Francisco at the Microsoft Reactor Space. Approximately 50 professionals based in and around the Bay area attended the event, which was sponsored by Zorlu Ventures USA. Following her remarks Dr. Demirci, a Professor at Stanford University School of Medicine at the Canary Center for Cancer Early Detection, delivered the keynote address which explored the road to academic entrepreneurship and initiatives to build leadership capacity. His group at Stanford has pioneered contributions in multiple fields including infectious diseases, fertility, cancer diagnostics, cell encapsulation, cryobiology, and biofabrication; they create novel technologies for disposable point-of-care (POC) diagnostics and monitoring. He was selected as one of the world’s top 35 young innovators under the age of 35 (TR-35) by the MIT Technology Review. He holds over 20 patents, translated into products through multiple start-up companies including DxNOW, Koek Biotechnology and LEVITAS. Dr. Demirci responded to questions from the audience and the event concluded with a networking session.